First up, a free, small-group seminar in my office near New York City for leaders of non-profit organizations. Check out the details and apply via this form. The deadline for applications is next Friday, so don't delay. I'll be hosting about fifteen leaders on October 15, and I apologize to those that I can't accomodate. Here's a recent review of the day-long office experience as well as a shorter review of a previous event, and a video from 2009. Second, for entrepreneurs, freelancers and people working for organizations seeking to make a ruckus, a weekend seminar at the fabulous Helen Mills Theater in New York on Saturday and Sunday, October 20 and 21. The Helen Mills is an intimate space with less than 125 seats, so there will be a lot of connection going on. Expect to be interacting with CEOs, up and comers and independent writers, impresarios and agents of change. Sunday adds a new format, and I'm hoping you'll come for both days and see how far it can take you. A weekend devoted to small businesses, entrepreneurs, freelancers and anyone in a larger organization that wants to take responsibility and make something happen. The internet has opened doors, made connections and created leverage. The post-industrial age is here, and it brings with it the opportunity to carve a completely different path–for you, for your team and for your organization. People who have attended previous events have left with new strategies, new tactics, and most important, new resolve on how to get through their Dip. Knowing that there are other people in the same place, and being able to establish lines of support can really change the way you do your work. The format: I'll set the stage with an hour-long talk about the role of impresarios, the connection economy and the chance to create work that matters. From that, we'll shift to a wide open Q&A session in which attendees share their stuckness, talk about their strategies and mostly ask about how this new way of thinking (and doing) can help them. I've discovered that by spending more than six straight hours leading the discussion and answering questions, I can start to get under your skin and help you see how this revolution is open to you. For the entire day, you'll be surrounded by fellow travelers, by people in just as much of a hurry as you are. I'll provide lunch and snacks (and lots and lots of coffee) and we'll go at it until about 3:45. It's a long day, but worth the effort. The next morning, the Sunday attendees will reconvene bright and early at 9. For Sunday's session, we're moving out of the theatre and into the group space upstairs. We'll spend the day alternating between group work, assignments, presentations and feedback from me. Both days include lunch, snacks, Q&A, surprises but, sadly, no dancing monkeys. This is my last public event until my book launches, and I hope you'll be able to join a very motivated, very talented group of people for a weekend that will both frighten and empower you to go do the work you're capable of. Get tickets here. There are a few early bird discount seats for blog readers. 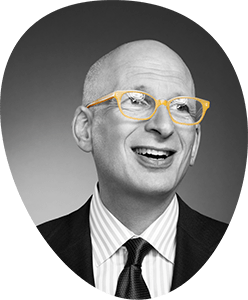 PS To be clear, Saturday is a classic Seth Godin Q&A session, designed to help you think through the challenges you're facing and to see the common elements that so many successful projects share. Sunday is that plus group work, presentations, thought exercises, the Shipit workbook and more. It builds on Saturday and is a smaller group, with more airtime for all.